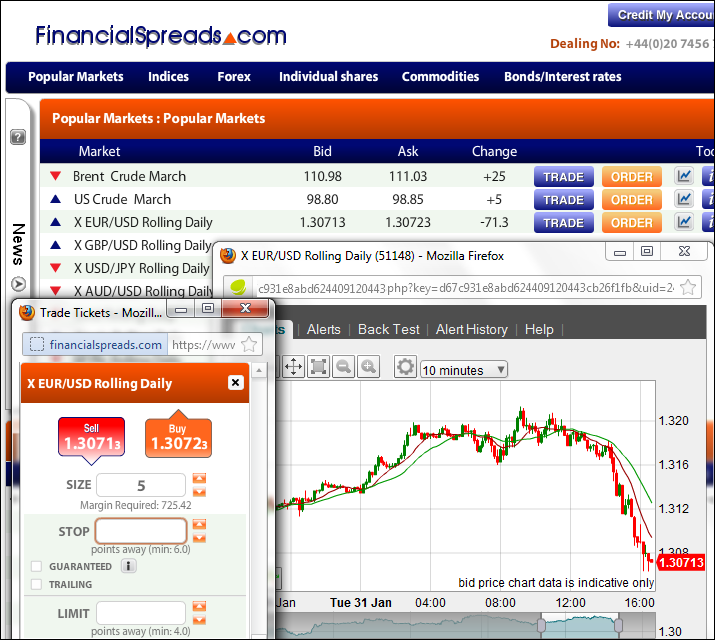 Financial Spreads has launched a new platform that offers a wide range of improvements as well as improved pricing. The FinancialSpreads.com website now offers new 'tear-off' functionality that lets investors split their trading screens allowing them to customise the platform to their choosing. For example a trader could tear-off their Open Trading Positions, Trading History, Order Book and Account Transactions so they can all be seen at the same time. The tear-off functionality also lets investors create as many different trade tickets as they like so that they can prepare their positions and then watch the markets move until they are ready to trade. This can be particularly useful during the volatility that the markets are currently experiencing. Other new features on FinancialSpreads.com include letting investors cherry pick which trades they close first. Traditionally, if a trader had two open positions on the same market and they wanted to close one trade then spread trading firms would force the investor to close the oldest position first. Now investors can select which positions they want to close. There are also further improvements to the risk management controls. Clients can now place closing orders when they initially make a trade. These orders can be set to lock in a profit but also used to close a trade and limit a loss if the market moves in the wrong direction. Note that normal Stop Loss orders are not guaranteed, in the event of the market gapping your spread bet will be filled at the next best level. Having said that, clients can opt for a Guaranteed Stop order. What many traders will be interested in though is the new pricing. Financial Spreads were already offering 1 point spreads on their FTSE 100 and DAX 30 Daily Rolling contracts. They have now also reduced the popular Wall Street and EUR/USD Rolling Daily markets to 2 points and 1 point respectively. Tight spreads are important in spread trading, tight pricing means that a market does not have to move as far before a trader can close a position for a profit. Financial Spreads is based in London and is a trading name of London Capital Group which is authorised and regulated by the Financial Conduct Authority. On the new Financial Spreads platform investors can trade over 2,500 markets including a wide range of international equities, stock market indices, forex markets, commodities, bonds and interest rates. The commission free trading service lets clients speculate on whether markets will go up or down and also includes access to charts and research data. Financial spread trading carries a high level of risk to your capital. It may not be suitable for all investors. Only speculate with money that you can afford to lose. Please ensure you fully understand the risks involved and seek independent financial advice where necessary.